If pistachio nuts aren't the best snack food out there, they're certainly on a short list. Pistachio benefits include protein, vitamins, minerals, and more. The perfect snack? Pistachio benefits include protein, phytochemicals, vitamins, and minerals. There’s no denying the popularity of the pistachio. That smooth, beige shell, with the crunchy green prize tucked within, is practically irresistible. And all those pistachio benefits make them a healthy choice, whether as a snack or a complement to a meal. We’ll dig in on pistachio benefits below. First, a quick hit on their history. 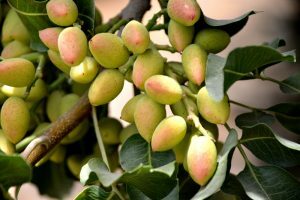 Pistachios (Pistacia vera), which are part of the cashew family, grow in grape-like clusters, each nut encased inside its own reddish hull. When ripe (in late summer and early fall), pistachios naturally split open. The drying process opens the shells further. They’re a favorite American snack today, but pistachios have been around forever. They’re one of only two nuts mentioned in the Bible (the other is almonds). Native to the Middle East—including what is now Turkey, Iran, and Syria—pistachios were considered an aphrodisiac by the Queen of Sheba. Chinese legend says they bring good luck to those who hear the shells pop open while sitting beneath the “smiling pistachio” tree. Plump with protein, phytochemicals, vitamins, and minerals, pistachios deliver a powerful punch of health benefits. A single one-ounce serving of pistachios is 49 nuts, from which you’ll get just 160 calories. Pistachios are packed with healthy, unsaturated fats and important nutrients, such as thiamine (16 percent Daily Value, or DV), vitamin B6 (18 percent DV), satiating dietary fiber (3 grams, 12 percent DV), and protein (6 grams, 12 percent DV). Most of us enjoy shelling pistachios ourselves, as opposed to buying pre-shelled bags. That’s a good thing: Research shows we gain a greater sense of satiety by opening the shell, eating the nut, and depositing the shells in a dish. It seems that seeing all of those empty shells sends a signal to the brain (and belly) that we’ve eaten more nuts than we actually have. Pistachios have the highest levels of potassium among all of the varieties of nuts. They contain several other minerals, too, including magnesium, copper, zinc, and iron, as well as valuable phytochemicals, including carotenoids. Plus, pistachios contain substances with antioxidant and anti-inflammatory properties, which is probably part of the reason that research has linked pistachio consumption with so many health benefits. In one study, for example, daily pistachio consumption by adults with type 2 diabetes was shown to improve cardiovascular risk by significantly lowering total cholesterol and the ratio of total to HDL (“good”) cholesterol and triglycerides compared to those who did not eat them. In addition, pistachios have been linked with weight control, thanks to their low calorie count and satiating effect (see sidebar). Pistachio nuts are harvested in late summer and into autumn. Is There a “Pistachio Season”? Pistachios are harvested in late summer and early autumn, but they’re available year-round. They’re sold in or out of their shells, raw or roasted, salted, unsalted, and seasoned. If you’re shopping for pistachios in their shells, look for partially open shells, which are easier to get into than shells that are mostly closed. The nuts should be green, and they sometimes have yellow streaks or spotting. Just as vegetable oils go rancid more quickly if they’re stored at room temperature, so, too, can pistachios and other nuts go rancid due to their high fat content. 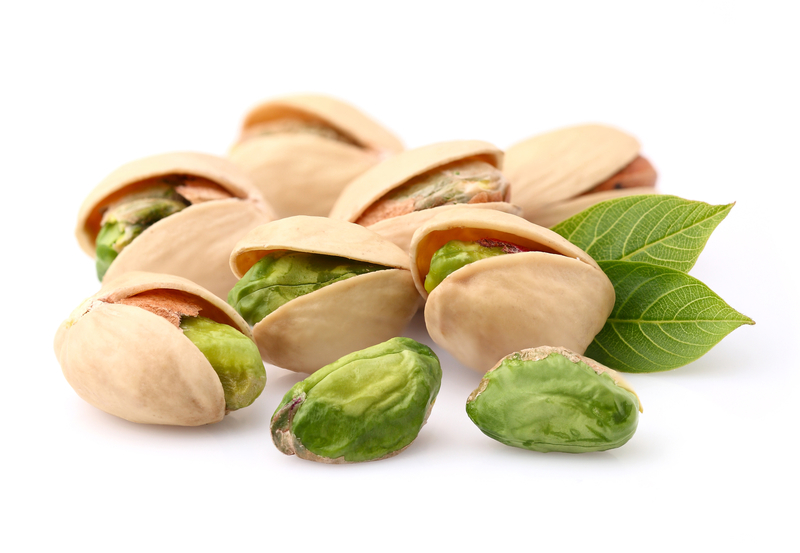 To prevent pistachios from going rancid, store them in the refrigerator or freezer, where they’ll keep for a year. Pistachios make a terrific grab-and-go snack. The protein, fiber, and fat in pistachios can help keep your appetite under control until your next meal. Using them as a meal complement, you can toss pistachios into pasta dishes, vegetable or grain side dishes, and even desserts (as an ingredient in cookies, for example). You can even blend pistachios into a healthy nut butter to spread on whole-grain toast or crackers. Want more ideas? Visit the American Pistachio Growers site to view recipes for Pistachio and Date Energy Bites, Pistachio Bread, and Blondies with Salted Pistachio and Lemon. 2 diabetes, almonds, anti inflammatory, antioxidant, appetite, brain, calories, cardiovascular, cardiovascular risk, carotenoids, cholesterol, diabetes, fiber, good cholesterol, hdl, health, iron, magnesium, nutrients, nuts, potassium, protein, thiamine, total cholesterol, Triglycerides, type 2 diabetes, vitamin, vitamin b6, vitamins, vitamins and minerals, weight control, whole grain, zinc.